Abstract: Code refactoring isn’t code rewriting. Refactoring is the process of restructuring existing computer code without changing its external behaviour. 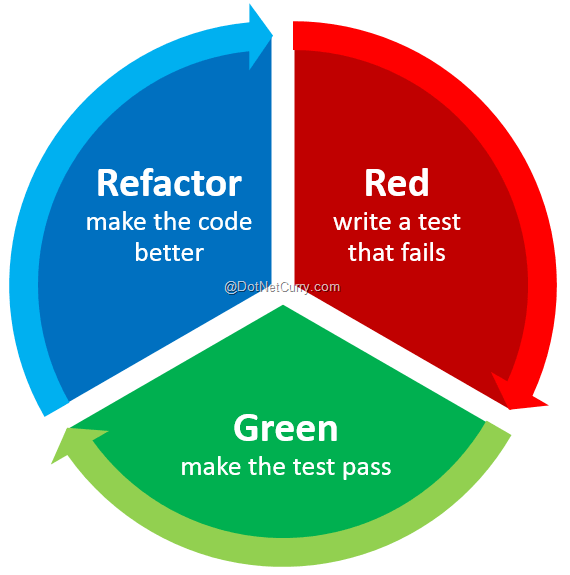 This Software Gardening article talks about what is refactoring, why to refactor your code and the built-in refactorings in Visual Studio. Comparing software development to constructing a building says that software is solid and difficult to change. Instead, we should compare software development to gardening as a garden changes all the time. Software Gardening embraces practices and tools that help you create the best possible garden for your software, allowing it to grow and change with less effort. Learn more in What is Software Gardening. Imagine that you have a beautiful rose garden. It takes many hours of work to keep it beautiful and the roses healthy. Did you know, a key aspect of growing roses is pruning. That is, you need to cut out the dead and dying flowers so that the young, healthy buds can thrive. Pruning roses also gives them a more attractive shape. But pruning can also be applied elsewhere. For example, in the timber industry, where entire mountainsides of forest need to be kept healthy, different types of pruning are used. The first of these is selective cutting, where specific types of trees are identified and only those are cut. Then there is thinning, where large trees are cut out of thick heavy forests, so the small trees that are struggling can grow and be healthy. Finally, there is clear-cutting, which is used to completely clear a side of a mountain of all trees. Certain types of trees will not survive if selective cutting or thinning is used, so clear-cutting is the only alternative. Also, if a forest is attacked by disease or insects, clear-cutting may be used to remove a section of forest in an effort to save the entire forest. In all cases, the timber company replants trees so that new growth will keep the forest healthy. In all cases, the forest is still a forest. Pruning has not changed the functionality of what nature gave. Do you prune your software? Just like the roses or the forest, pruning is necessary to keep software healthy. As software gardeners, our term for pruning is refactoring. The first important thing you need to know about refactoring is that it isn’t rewriting. Let’s think back to a past column I wrote about unit testing. The process of unit testing is shown in Figure 1. You can see that refactoring is a key part of unit testing. And, not surprisingly, unit testing is a key part of refactoring. After all, how do you know if you haven’t changed the external behavior of the piece of code, without testing? The most famous book on refactoring was written by Martin Fowler. Its title is “Refactoring: Improving the Design of Existing Code”. The book is a catalog of refactorings and includes a chapter called “Bad Smells in Code” that discusses ways to identify and fix problematic code that could be a good candidate for refactoring. The smells include duplicated code, long methods, large classes, and long parameter list. (I once had to update code written by someone else and found a class with a constructor that had 144! parameters). There are nearly 20 more code smells listed. In addition to describing code smells and cataloging refactoring patterns, the book gives reasons to refactor: improve the design of software, make software easier to understand, help you find bugs, and help you to program faster. This last one seems contradictory. How can you program faster if you have to refactor the code? The answer is that refactoring makes it easier to read the existing code. Martin Fowler also lists what he calls, “The Rule of Three”, which are three rules for when to refactor. First, you should refactor when you add function. Second, refactor when you need to fix a bug. And third, refactor as you do a code review. Once you’ve identified the specific code smell, the book points you to refactorings that can be used to fix it. You can fix the code with copy and paste. But there is a better way. Visual Studio has some built-in refactoring tools that are easier to use than copy and paste. Hover over a variable in the Visual Studio editor (for this column, I used the free Visual Studio 2013 Community Edition, which is functionally equivalent to VS 2013 Professional), then right-click and select Refactor. You’ll see that six refactorings are available. You will also notice that each refactoring has a keyboard shortcut that begins with Ctrl+R. In the rest of this column, I will take you through each of these refactorings. The late computer scientist Phil Karlton said, “There are only two hard things in Computer Science: cache invalidation and naming things.” (A variation says “There are two hard things in computer science: cache invalidation, naming things, and off-by-one errors.”). How often have you named a class, variable, or other object and after sometime realized that the name you chose turns out to be wrong? How often have you needed to name something and wasted time trying to come up with just the right name for it before even typing it into your editor? Often times the correct name comes to you only after you’ve seen how it will be used in the code. This is where Rename Refactoring comes into play. 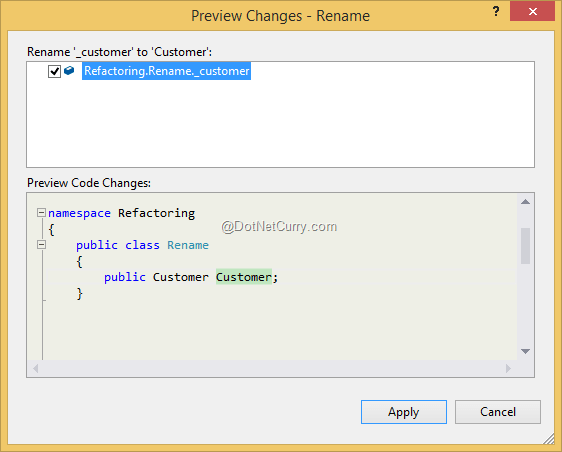 In Visual Studio, the Rename Refactoring works on more than just a method. It can be used on variables, classes, even namespaces. Place the cursor on the object to be renamed and press Ctrl+R,Ctrl+R (think of this as Refactor, Rename). The Rename dialog appears. Figure 3. Caption: The rename dialog is used for the rename refactoring. Enter the new name and select the options you want, then select OK. If you checked Preview reference changes, you will get an additional dialog showing you where each refactoring takes place and what the changes will look like. You can then unselect the places you don’t want the refactoring to occur. Click Apply in the Preview Changes dialog and the refactorings will be made. One of the rules for good methods is that a method should do only one thing. Also, a good method will be short and not require you to scroll though lots of code. 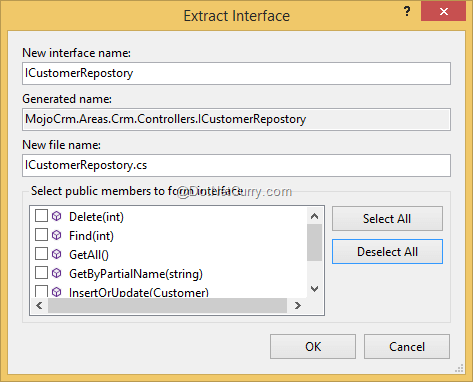 This next refactoring, Extract Method helps you fix these issues by removing code and putting it in its own method. You can also use this refactoring to simplify code. To use this refactoring, highlight the code to extract, then press Ctrl+R,Ctrl+M (Refactor, Method). Here’s some real code from one of my projects. After I wrote the code and it passed unit tests, I went back to refactor. The original method was about three screens long. This piece of code has a smell in that it has several nested if statements. I highlighted the entire code section and pressed Ctrl+R,Ctrl+M. The Extract Method dialog was displayed. Notice how the refactoring tools figured out what parameters the method needed and set those up automatically. I entered the name for the new method and clicked OK. Visual Studio did all the work of creating the method in my class and replacing the selected code with a single line of code. I then refactored the nested if statements. Later on, I decided my original name wasn’t quite right and used the Rename refactoring to change the name of the method. In the end, the code is easier to read and maintain. Length and width are technically fields, not properties because they don’t have getters or setters. Now let’s look at how to do this refactoring in Visual Studio. Put the cursor on length in the Line class then press Ctrl+R,Ctrl+E (Refactor, Extract). 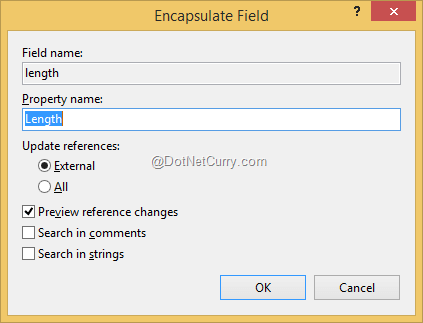 The Encapsulate Field dialog is displayed. Visual Studio recommended ‘Length’ as the property name. You can change it to something else if you want. When you click OK, a Preview dialog is displayed. Click Apply there. Here’s the refactored code. This is nice and tidy and follows a common standard that property name begin with a capital letter. Interfaces are a terrific way to get reuse and inheritance in your code. They also make code easier to unit test because it’s quite easy to mock an interface. The Extract Interface refactoring is very useful for that legacy code that you need to test and it looks at the class and creates an interface for it. Let’s see this refactoring in action. Here’s the original method. Note that I’ve left out the actual implementation code. Place the cursor on the class name and press Ctrl+R,Ctrl+E (Refactor, Extract) to display the Extract Interface dialog. 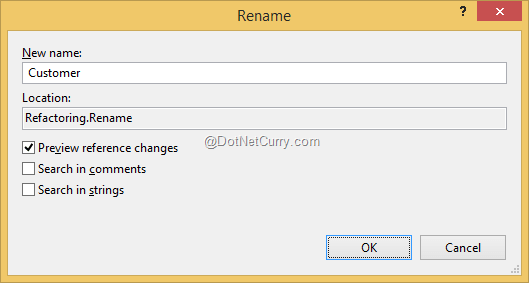 Visual Studio suggests a name for the Interface and allows you to select which methods to include. I selected all except GetByPartialName. When you click OK, Visual Studio created a new file (ICustomerRepository) and placed it in the same folder as the original class. The original class is then changed to inherit from the new interface. Now it’s easier to mock the code or substitute a different repository implementation for this one. Getting all the parameters you need for a particular method is hard. As you develop the functionality, you realize that some parameters aren’t needed at all. Others may turn into properties or fields. It’s easy to do this if the method is called one or two times, but what if you call it many times from many places in the project? Then it becomes more difficult. This next refactoring helps you remove parameters. To use this refactoring, place the cursor over either the method definition or usage and press Ctrl+R, Ctrl+V (Refactor, remoVe) to display the Remove Parameters dialog. 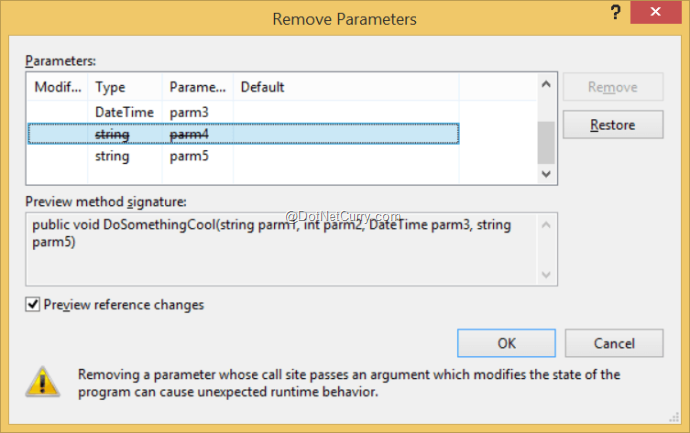 Figure 8: It’s easy to remove parameters with the Remove Parameters dialog. Select the parameter to remove and press Delete. The parameter you want to remove is then shown in strikeout font and a preview of the method is shown. Click OK. If you selected Preview reference changes, a second dialog showing the changes is displayed. Click Apply. Visual Studio then refactors out the parameter. Do you think about the order of parameters in a method? Does it really matter? Good coding practices says it does. You should order parameters from most important to least important and optional parameters should fall at the end. Now, you may have a differing opinion and that’s okay. But this refactoring helps you get parameters in the order needed. Interestingly, this is one refactoring pattern Martin Fowler doesn’t catalog. Now on to the usage. Place the cursor on the method definition or usage and press Ctrl+R, Ctrl+O (Refactor, reOrder). The Reorder Parameters dialog is displayed. 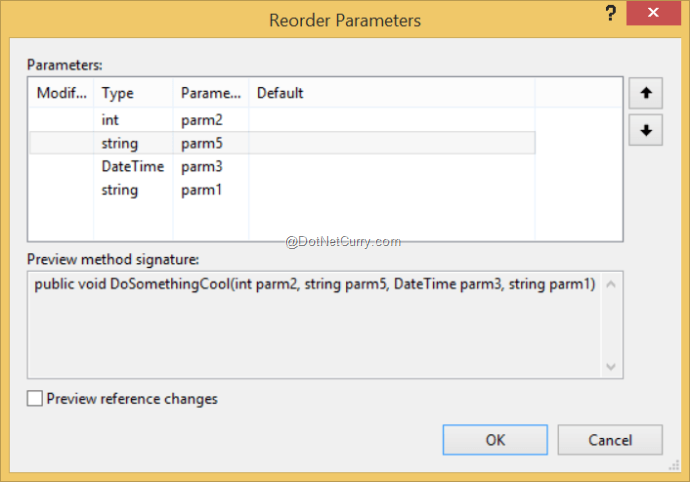 Figure 9: Changing parameter order with the Reorder Parameters dialog. Select the parameter to move, then use the mover arrows on the right. You can optionally preview changes. Click OK, then Apply if you previewed changes. Again, Visual Studio does all the updates for you. There you have it. You’ve learned a bit about what refactorings are and why you want to refactor your code. I have shown you the built-in refactorings in Visual Studio. If you look at the Martin Fowler book, you’ll see dozens of refactorings. 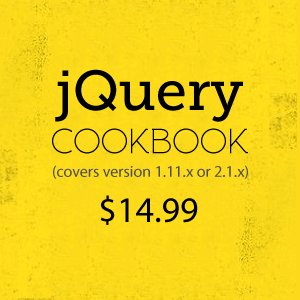 He also has an online catalog with even more refactoring at http://refactoring.com/catalog/. If you want more automatic refactorings, look to tools like Resharper or CodeRush. These commercial tools add enhancements to the built-in Visual Studio refactorings and add even more refactorings. Refactoring your code is important to keep it maintainable and easy to read. It also helps reduce potential bugs and could improve your application’s performance. It’s pretty clear that refactoring is a practice that will keep your code lush, green, and vibrant. Read our Software Gardening article series. I spent 3 hours reading the entire software series. To sum it up, it was FANTASTIC! Great article. I especially liked the "refactor -rename" section with the two hard things in computer science and that you write for people first and computer second. Really resonated with me. Nice work and summary of the process! Laurence, Thank you. I hope to keep the good stuff coming. Next up is a series of articles on Seeds. On your refactor of Line you left the field length public. BTW, the "Rule of three" is about code duplication, it says that you can have a second duplication of code, but the third time you have to refactor.